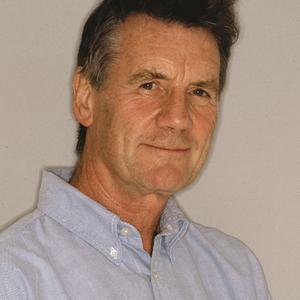 Michael Palin’s second novel, The Truth, was published in July 2012. His new four-part BBC1 travel series, Brazil, will be broadcast in Australia in November. Michael Palin was born in Sheffield, went to Shrewsbury School and then to Oxford where he read history, performed in many comedy shows, and started working with fellow writer and performer Terry Jones. After Oxford, Michael and Terry went on to write for various BBC comedy shows, notably The Frost Report and The Two Ronnies. In 1967, they teamed up with Eric Idle to write and perform the children’s comedy series, Do Not Adjust Your Set. In 1969 came Monty Python’s Flying Circus, which firmly established Michael’s comic reputation, along with his five collaborators Graham Chapman, John Cleese, Terry Gilliam, Eric Idle and Terry Jones. This team made 45 Python episodes and five feature films, including Monty Python and The Holy Grail, Monty Python’s Life of Brian and The Meaning of Life. At BAFTA, in 1987, the Monty Python team received the Michael Balcon Award for outstanding contribution to cinema. Michael’s other feature film acting credits include Terry Gilliam’s cult feature Brazil, Jabberwocky, The Missionary (which he wrote) Time Bandits (written with Terry Gilliam), American Friends (which he also co-wrote), A Private Function, A Fish Called Wanda, which won him a BAFTA Award for best supporting actor, and Fierce Creatures. A self-confessed dromomaniac (travel addict), Michael contributed to two BBC series of Great Railway Journeys of the World, in 1980 and 1994. He also indulged his wanderlust in seven huge adventures for the BBC, Around the World in 80 Days, Pole to Pole, Full Circle, Hemingway Adventure, Sahara, Himalaya and New Europe, which were enormously successful award-winning television series, books and audios. In 2008 he filmed Around the World in 20 Years, a programme celebrating his first travel series, Around the World in 80 Days. An updated 20th anniversary edition of the book was also published. In 2006 the first volume of his diaries, 1969-1979: The Python Years, spent many weeks on the bestseller lists and in 2009 the second volume, 1980-1988: Halfway to Hollywood, was published. Michael was made a CBE in the 2000 New Year’s Honours List for services to television drama and travel. In 2002 he received the Lifetime Achievement Award at the British Comedy Awards and in 2005 Michael was given a BAFTA Special Award. Between 2009 and 2012, Michael was president of the Royal Geographical Society. He lives in North London with his wife Helen.